Source: CICH graphic created using data adapted from Sinha et al., 2011, p. 5; Trocmé et al., 2005, p.10. Article: Sinha, V. & Kozlowski, A. 2013. The Structure of Aboriginal Child Welfare in Canada. The International Indigenous Policy Journal, 4(2). http://ir.lib.uwo.ca/cgi/viewcontent.cgi?article=1127&context=iipj&sei-redir=1&referer=http%3A%2F%2Fscholar.google.ca%2Fscholar%3Fstart%3D50%26q%3Daboriginal%2Badoption%2Bin%2Bcanada%26hl%3Den%26as_sdt%3D0%2C5%26as_ylo%3D2007#search=%22aboriginal%20adoption%20canada%22-accessed August 21, 2017. 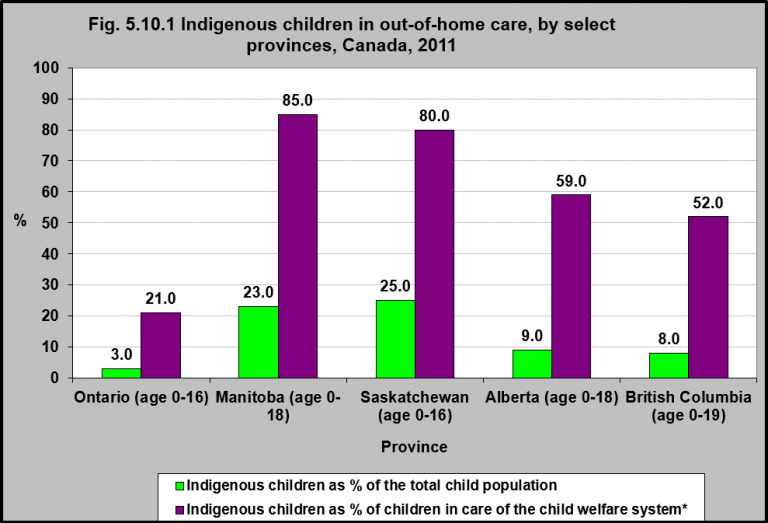 Indigenous children make up a small proportion of the total population of many provinces but a significant number of children in care of the child welfare system (e.g., in Foster Care, Group Home, Institution or Kinship care). In Manitoba and Saskatchewan almost 25% of their total populations are Indigenous. However, Indigenous children account for over 80% of children in care of the child welfare system. For British Columbia and Alberta the percentages are even more staggering. In Alberta only 9% of children are Indigenous but account for 59% of all children in care of the child welfare system and in BC, Indigenous children make up 8% of all children but account for 52% of all children in care of the child welfare system. 1Trocmé, N., Knoke, D., & Blackstock, C. (2004). Pathways to the overrepresentation of Aboriginal children in Canada’s child welfare system. Social Service Review, Dec., 577-600.